Sherbrooke, Que. 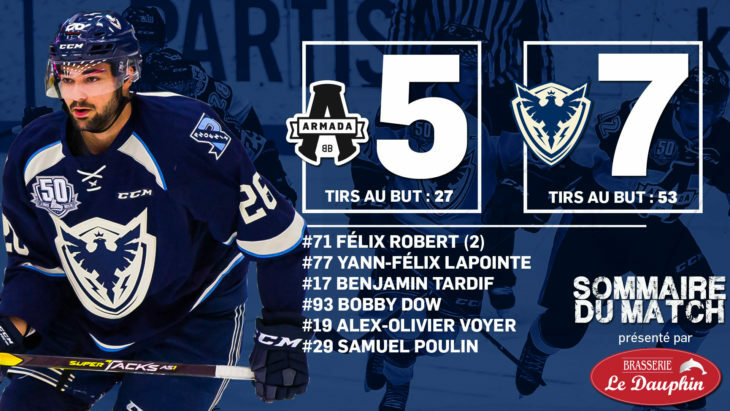 – Félix Robert’s hot play of late continued into Sunday’s contest as the Lac-Mégantic native added three more points, bringing his total to 12 in his last four games as he helped his team to their fourth straight victory with a 7-5 win over the Blainville-Boisbriand Armada. Robert credited his teammates and line mates in particular when asked about his recent success. “Mostly to keep it simple. My teammates and line mates have helped me a lot. They’ve put the puck to the net, drove the net, made some good passes and shots so I think my line mates have been the key,” said Robert. Normally when you outshoot your opponent 53-27 the score is destined to be lopsided, but things played out differently today. 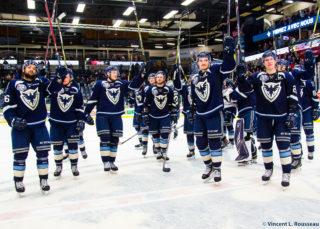 It wasn’t until Samuel Poulin’s empty netter with 25 seconds left that the Phoenix could breathe a sigh of relief. Despite a dominating effort from the Birds, the Armada found a way to stick around all game long but surrendered finally. At the end of the day, the team who deserved to win, did. And today, it was the Phoenix. “I can’t be disappointed with today’s game. I think we dominated from start to finish. They were opportunistic on some plays but for the rest we really controlled the game so I can’t be upset with my guys. We had a lot of time of possession and managed the puck well. We brought a lot of pucks to the net and missed on some chances, but I’m really pleased with my club tonight,” said Stéphane Julien. 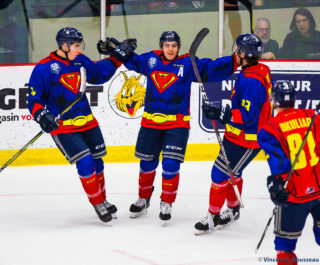 After a scoreless first period where the Phoenix were frustrated by their former teammate, Brendan Cregan, they exploded for five goals in the middle frame. However, they needed to come back from being down a goal on three separate occasions before grabbing their first lead of the game. Olivier Crête-Belzile opened the scoring, but for the wrong team. As the defenseman dove to break up a breakaway, he slid into his own net and brought the puck with him for the game’s first goal, which was credited to Benjamin Corbeil. 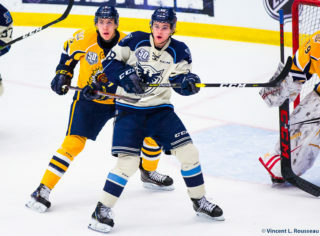 Félix Robert brought the Phoenix back even on the power play but 1:20 later, Alexander Katerinakis restored the Armada’s lead. Yann-Félix Lapointe knotted it up at 2-2 at 10:14 of the second period, however the Armada jumped ahead again, this time thanks to Thomas Lacombe. Then, the Birds tallied three goals in 3:05 to take a 5-3 lead into the intermission. Benjamin Tardif, Bobby Dow, Félix Robert each scored toward the end of the period, while Ryan Da Silva picked up four assists in the frame. The first half of the final 20 belonged to the Armada, but the Phoenix controlled the closing portion. Nathan Lavoie and Frédéric Abraham beat Dakota Lund-Cornish to tie the game 5-5 before the midway point of the period. Then, at the 12:00 mark of the third, Taro Jentszch slid the puck over to Alex-Olivier Voyer who snapped it short side past Cregan for the game winning goal. Samuel Poulin added an empty netter to make it a 7-5 final. 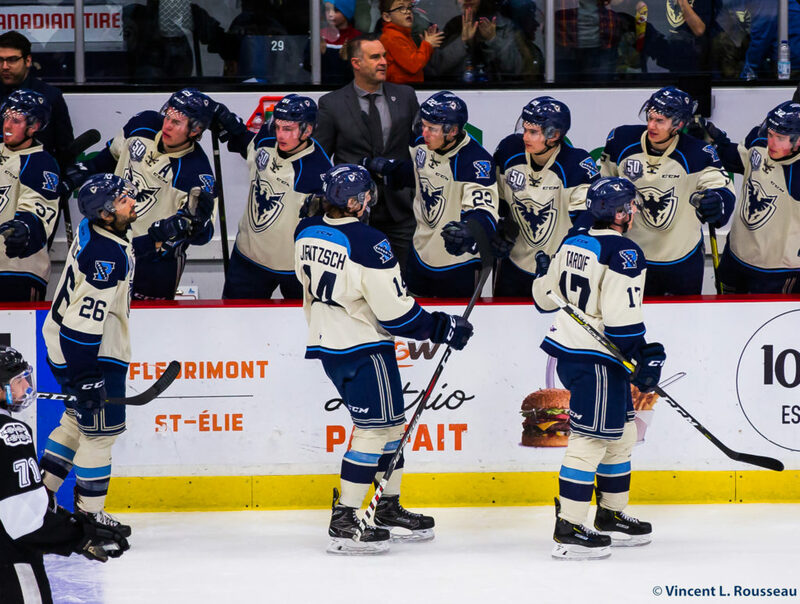 The Phoenix visit Drummondville on Wednesday, February 13th at 7:00 p.m. They’ll return home next weekend for a pair of games against Shawinigan on Friday and Cape-Breton on Sunday.